Dr. Alison completed 3 years of additional training beyond dental school to acquire the expertise to provide orthodontic care. In addition, Dr. Alison completed the process of Board Certification in December 2012 by the American Board of Orthodontics. Board Certification requires many additional hours of preparation to test judgment, skill and knowledge to demonstrate the highest quality of work. Early Care or Interceptive Treatment can begin as early as 6 years of age where the appropriate spacing for permanent teeth to erupt in the upper or lower arch can be regained or held as needed until the time of eruption. Limited Early Treatment or Phase I Treatment may begin at age 8-10 years old. Treatment at this age allows problems, such as a posterior crossbite, that are more reliably and effectively treated at younger ages, to be addressed. Adolescent or Phase II Treatment entails placing braces on all permanent teeth and addressing all orthodontic problems. Adult Treatments are provided to adults of all ages and varying levels of treatment. Braces limited to one arch or limited in time or scope to address only particular orthodontic problems may be a good option for some adults. Comprehensive treatment, or braces on all the teeth, in order to address all orthodontic problems is a valuable option for any adult. In addition, some adults can benefit from braces in conjunction with dental work to fully enhance their smile and correct their bite. Limited Treatment with Aligners is offered to patients with an adult dentition. Aligners or clear removable appliances can gradually move teeth and are good options for some patients. 1. What is an orthodontist? An orthodontist is a dentist that has completed an additional 2-3 years of training to specialize in the diagnosis, management, and correction of problems related to the development and eruption of the permanent teeth, the bite relationship, the jaw relationship, and the tooth alignment. 2. 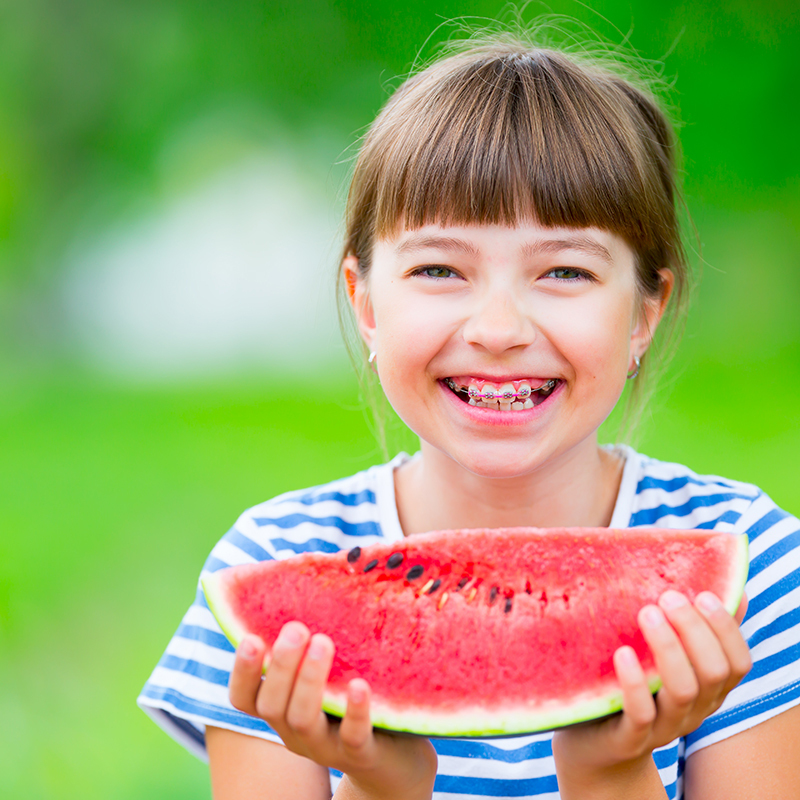 What age should my child have an orthodontic evaluation? The American Association of Orthodontics recommends that a child have an evaluation by an orthodontist by the age of 7 or earlier if the parents or dentist have a concern. 3. Why is it important to have orthodontic treatment at a young age? Orthodontic treatment is more efficiently accomplished while the patient is still growing. In addition, some orthodontic problems are much more effectively treated before all the permanent teeth have erupted and jaw growth is complete (i.e., upper jaw expansion and the correction of minor jaw imbalances). 4. What causes crooked teeth and/ or bite problems? Crooked teeth and/ or bite problems are caused by a number of factors. These factors include but are not limited to: discrepancy between tooth size and jaw size (ie, large teeth in a small jaw), missing teeth, blocked out permanent teeth from early loss of baby teeth, habits (i.e., thumb sucking), and heredity. 5. How do teeth move? Brackets are attached on the teeth and then can be moved along the archwire into more ideal positions. The archwire has an ideal arch form and once deformed into each bracket will apply a force to each tooth in the attempt to return to its ideal arch form. From the biological perspective, when a force is applied to a tooth, the bone that supports or holds the root of the tooth in place is gradually removed on one side and replaced on another side to allow the tooth to move within the bone. 6. Will it hurt? The placement of the brackets and bands on the teeth does not hurt but is a time-consuming process. Once the wire is placed into the brackets, the teeth will feel a pressure and may be sore for 3-5 days. In addition, there is an initial adjustment of the lips, cheeks, and gums to the presence of the braces such that soreness may occur for 10-14 days. 7. What are my options as an adult? Orthodontic treatment can be accomplished at any age. Some adults may wish to only address some of the orthodontic problems with a removable appliance or braces limited to one jaw. Full appliances or comprehensive treatment is designed to address all orthodontic problems and is a valuable option for any adult. Adult’s teeth tend to move slower than children’s teeth, such that the treatment may take longer; however, wonderful orthodontic results can be achieved. 8. Should I see my general dentist while I have braces? YES!!! It is very important to maintain oral exams and cleanings while undergoing orthodontic treatment to ensure that the teeth and gums are healthy during and following orthodontic treatment. Dr. Alison is happy to remove the wire for all her patients. 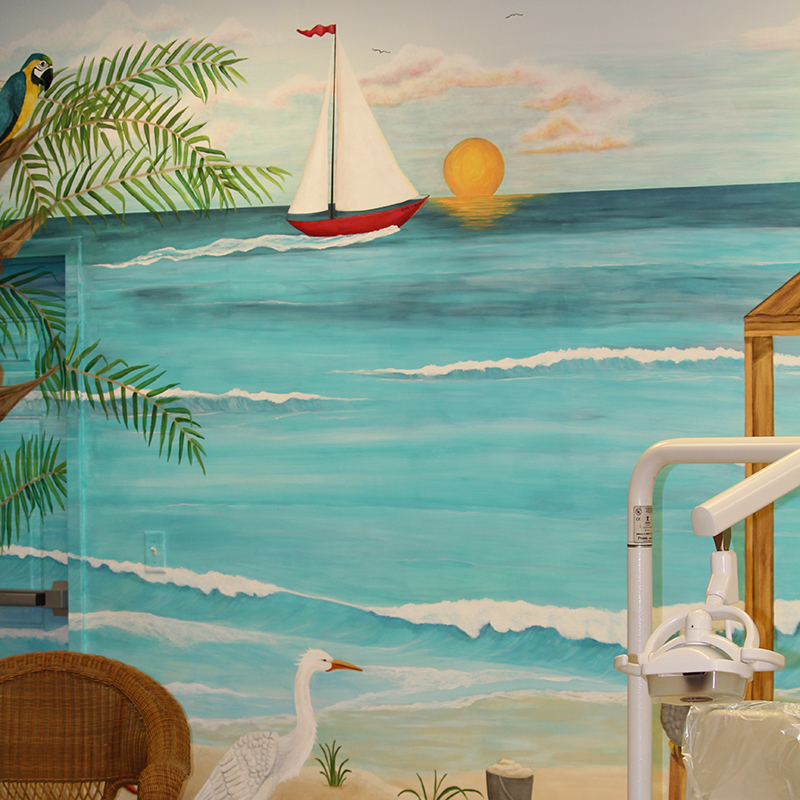 Dr. Richard’s patients have the added convenience of getting their teeth cleaned just down the hall from Dr. Alison. 9. Will braces interfere with playing a musical instrument? No, but there usually is a period of initial adjustment. Sometimes a “comfort sleeve” can be applied to the braces to make playing the instrument more comfortable. 10. Will braces interfere with playing sports? Any sport can be played with braces. Patients participating in contact sports should be wearing a mouth guard to protect their teeth and lips from injury. • Appliance Care – check your appliance daily and alert Dr. Alison if something is broken or missing. • Elastics & Headgear – always wear as directed. They are critical components in ensuring efficient and successful tooth movement. Remember, not all types of successful tooth movements can be accomplished by routine orthodontic adjustments alone. • Braces and Dental Care – brush well with a soft toothbrush in order to prevent white spots, cavities and swollen gums. It also ensures your appliance is working efficiently. • Foods to enjoy – soft foods in bite-sized portions such as soups and stews, pastas, meatloaf, hummus, scrambled eggs, hot cereals, tuna, chicken and egg salads. Avoid sticky, hard and crunchy foods such as popcorn, ice, nuts, hard candy and hard pretzels. Knowing when and how to handle some problems at home and when to call Dr. Alison are important in making your orthodontic treatment seamless and efficient. • Loose or Poking Wires: attempt to reinsert the wire with tweezers and/or push down with a pencil eraser or other blunt object. Cover with wax to avoid soreness and call Dr. Alison to alert the office that there is something bothering you. • Loose Expander: call the office ASAP. If you’ve been turning the expander, stop turning. • Loose Bracket or Band: if intact, leave in place and use wax to avoid soreness. If not intact, save all parts and call Dr. Alison. Re-bonding may be delayed until the next business day. • Broken Retainer: call Dr. Alison the next business day to make an appointment for an evaluation. • General Discomfort or Soreness: rinse with warm salt water and take Ibuprofen for pain (if no medical contraindications). In all cases, if pain or discomfort persists, call Dr. Alison immediately. Limited Early Treatment or Phase I Treatment may begin at age 8-10 years old. Treatment at this age allows orthodontic problems, such as a posterior crossbite or the protrusion of front teeth, to be efficiently and reliably treated. This early treatment reduces the risk of trauma or damage to the teeth as well as prevents future more complicated orthodontic problems. Adolescent or Phase II Treatment includes placing braces on all permanent teeth and addressing all orthodontic problems.